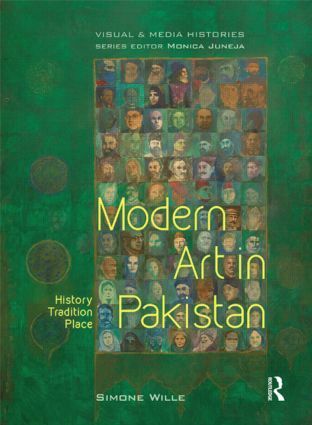 Modern Art in Pakistan examines interaction of space, tradition, and history to analyse artistic production in Pakistan from the 1950s to recent times. It traces the evolution of modernism in Pakistan and frames it in a global context in the aftermath of Partition. A masterful insight into South Asian art, this book will interest researchers, scholars, and students of South Asian art and art history, and Pakistan in particular. Further, it will be useful to those engaged in the fields of Islamic studies, museum studies, and modern South Asian history. "The book “Modern art in Pakistan” is a valuable reference to understand artistic practice in Pakistan, after the partition of the subcontinent back in 1947. Its author is Simone Wille, an independent art historian, writer and researcher currently based in Austria, whose research has basically focused on the development of contemporary art in Pakistan…this book offers interesting insights on the particularities of modern Pakistani art in relation to different disciplines from history to culture, politics and society. An excellent reading for those fascinated with history of art in general and modernist art in South Asia and in Pakistan in particular." Simone Wille is independent art historian, researcher, and writer currently based in Vienna, Austria. This series takes as its starting point notions of the visual, and of vision, as central in producing meanings, maintaining aesthetic values, and relations of power. Through individual studies, it hopes to chart the trajectories of the visual as an activating principle of history. An important premise here is the conviction that the making, theorising, and historicising of images do not exist in exclusive distinction of one another. Opening up the field of vision as an arena in which meanings get constituted simultaneously anchors vision to other media such as audio, spatial, and the dynamics of spectatorship. It calls for closer attention to inter-textual and inter-pictorial relationships through which ever-accruing layers of readings and responses are brought alive. Through its regional focus on South Asia the series locates itself within a prolific field of writing on non-Western cultures, which have opened the way to pluralise iconographies, and to perceive temporalities as scrambled and palimpsestic. These studies, it is hoped, will continue to reframe debates and conceptual categories in visual histories. The importance attached here to investigating the historical dimensions of visual practice implies close attention to specific local contexts which intersect and negotiate with the global, and can re-constitute it. Examining the ways in which different media are to be read into and through one another would extend the thematic range of the subjects to be addressed by the series to include those which cross the boundaries that once separated the privileged subjects of art historical scholarship from the popular – sculpture, painting, and monumental architecture – from other media: studies of film, photography, and prints, on the one hand; advertising, television, posters, calendars, comics, buildings, and cityscapes on the other.